Josh Whitford, DDS, is a longtime dentist with more than a decade of professional experience. 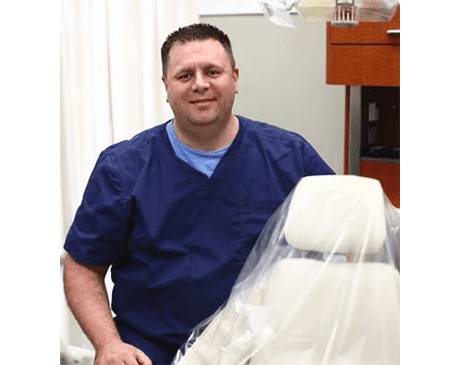 The proud owner of Silver Lake Dentistry in Raymore, Missouri, Dr. Whitford considers it a privilege to serve patients around the Raymore, Cass County, and extended Kansas City area. Born and raised in Maysville, Dr. Whitford is a Missouri native, passionate about staying connected to his community and lending a helping hand when needed. He earned his Doctor of Dental Surgery (DDS) degree from the University of Missouri Kansas City’s School of Dentistry and is currently an active member of the American Dental Association and Missouri Dental Association (AACD). Dr. Whitford’s interest in the medical field began at an early age thanks to his father, a lifelong pharmacist who instilled in him a passion for promoting community health and wellness. A small-town doctor at heart, Dr. Whitford offers friendly, personalized care in a way that others simply can’t match. When he isn’t hard at work improving smiles, Dr. Whitford can always be found cheering on his beloved Kansas City Chiefs or working on his golf swing. To learn more about all the services Dr. Whitford offers, call Silver Lake Dentistry today.